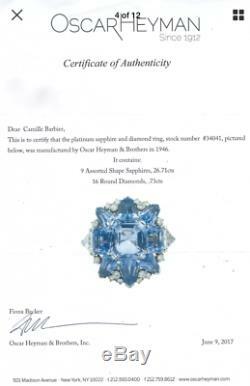 » AGL Oscar Heyman Platinum 1946 27.44CTW No Heat Ceylon sapphire VS diamond ring (SFLmaven). 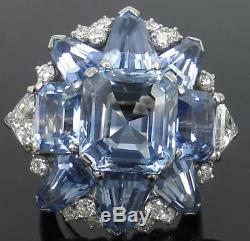 AGL Oscar Heyman Platinum 1946 27.44CTW No Heat Ceylon sapphire VS diamond ring. W/ Oscar Heyman certificate of authenticity & AGL cert! 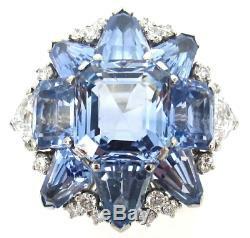 AGL Oscar Heyman Platinum 1946 27.44CTW No Heat Ceylon sapphire VS diamond ring size 6.25. This impressive piece of jewelry is crafted in gorgeous Platinum and features 9 genuine No Heat Ceylon sapphires, with a combined weight of approx. 8.73CT (12.12 X 11.15mm) Emerald cut center sapphire. This ring also has multiple Excellent VS-1 clarity/Colorless G color Round/Trillion cut diamonds, with a combined weight of approx. These stones are prong set in an exquisite looking elegantly designed ring. Anyone will cherish this amazing ring. Perfect addition to any fine jewelry collection! 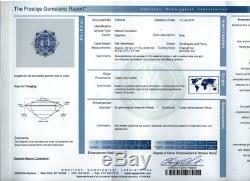 Complete with Oscar Heyman Certificate of Authenticity & AGL Prestige Gemstone Report! If we have box, papers, documents, etc. For this item there will be photos below. If there are no photos of these, we do not have them. Diamond Weight: Total weight is approximately. Excellent VS-1 clarity/Colorless G color diamonds. 9 No Heat Ceylon sapphires, total approx. SIZE: United States & Canada. SIZE: United Kingdom, Ireland, Australia, New Zealand. SIZE: India, China, Japan, South America. SIZE: Italy, Spain, Netherlands, Switzerland. Please view all the photos below as part of the description. A careful eBayer who takes the time to study the photos, reads the entire description, and asks pertinent questions is our best customer. Flawless : FL : No inclusions or blemishes visible under 10x magnification. Internally Flawless : IF : No inclusions visible under 10x magnification, only small blemishes on the diamond surface. Very, Very Slightly Inclusions : VVS : Minute inclusions that are difficult for a skilled grader to see under 10x magnification. Very Slightly Inclusions : VS : Minor inclusions that are slightly difficult for a trained grader to see when viewed under 10x magnification. Slight Inclusions : SI : Noticeable inclusions that are easy to very easy for a trained grader to see when viewed under 10x magnification. Imperfect : I : Obvious inclusions that are clearly visible by the naked eye to a trained grader. All of our diamonds are real and none of our gold is plated (unless otherwise noted). These "dark spots" are not on the jewelry. Any markings will be described in our Condition area. We only sell very desirable, high quality, fine estate jewelry. We can't guarantee accuracy of watches as they may need cleaning or servicing. If there is no picture of an appraisal, we do not have one for the item. Grading of jewelry is subjective. This is due to our high volume. We reserve the right to re-list items not paid for after 7 days. This includes alteration or damage to any and all box(es), documentation, paper(s) and/or certificate(s) that accompany item. Please do not ask us not to leave feedback. The item "AGL Oscar Heyman Platinum 1946 27.44CTW No Heat Ceylon sapphire VS diamond ring" is in sale since Wednesday, January 9, 2019. This item is in the category "Jewelry & Watches\Fine Jewelry\Fine Rings\Gemstone". The seller is "sflmaven" and is located in Fort Lauderdale, Florida.